Although my first attempt at the Polish cured meat Kindzuik is still a few months away from completion, I was eager enough to start a second one. I’m not sure why I’m so stuck on this recipe. Perhaps because it’s so new to me, but I also think part of it is the challenge of trying something radically different. It’s hard to find much information on Kindzuik, but I did find a whole forum thread on it…in Polish. 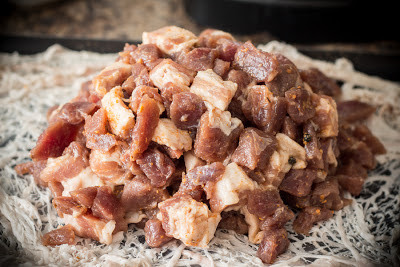 But it does have some great photos, including some Kindzuik made with cured pork belly cubed up and added to the mix. 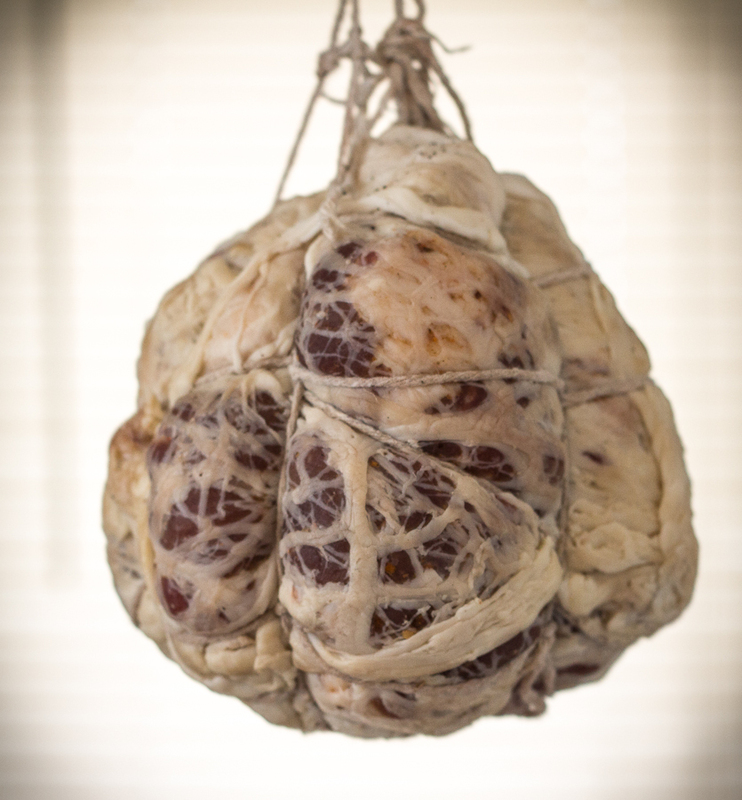 It was a beautiful shot, with the white, snowy fat standing out among the striations of rosy cured meat. So I had to try it. Kindzuik is often cured in a pig’s stomach, rather than sausage casings, but it can also be cured in a pork bladder. I’m still looking to get my hands on a stomach, so I used caul fat again. For this batch, I blended North WoodsRanch’s Berkshire pork belly with some grass-fed beef, then tied it with string to simulate the look of a stuffed pork bladder. Now the Kindzuik will hang and dry for a few weeks before being smoked with alder wood, then further aged.